Carnival have announced today that the popular kids brand Dr.Seuss is coming to all of its ships in the fleet! This is great news for family cruising and increases the onboard features for Carnival ships. This will be an industry first and will be known as “Seuss At Sea” and will offer not just activities for kids but onboard entertainment and great dining experience for all passengers. Guests will be able to attend a Dr.Seuss event in the dining room which will feature the Green Eggs and Ham Breakfast with the Cat in the Hat and Friends. Foods from the brand will be included along with traditional dining options. This really does take the “FUN” further because even the dining room waiters will wear special Dr.Seuss uniforms and there is to be popular characters including Cat in the Hat, Thing One and Thing Two, and Sam. They will have interactions with guests in the dining room and sure will be a good photo opportunity. This event will be offered every first sea day of the cruise but will cost a small fee of $5.00 for each guest. It doesn’t stop there but also plenty of Dr.Seuss merchandise will be available onboard including the famous book collections. We are predicting these items will be sold at the venues of the events and in the “Cherry on Top” shop but that’s not officially confirmed yet. There are going to be many Dr.Seuss events and activities across the onboard schedules and all ships in the fleet will be selling products from the company. The cruise line will show special movies on the large open deck screen (Seaside Theater) including “The Cat in the Hat” and Dr. Seuss’s “How the Grinch Stole Christmas”. There is to be even more special spaces for kids to play and have fun but the new Dr.Seuss spaces will be added to the Carnival Freedom during its planned refurbishment dry-dock in May 2014. 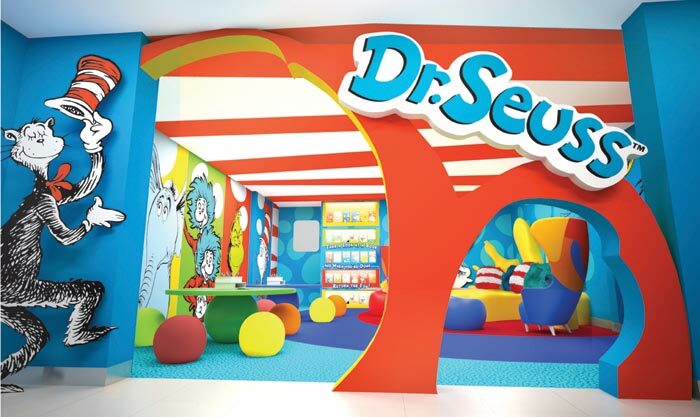 The dedicated Dr.Seuss themed space will also be featured on Carnivals upcoming cruise ship the Carnival Vista when it launches at the start of 2016. The new space will also have plenty of Dr.Seuss items for kids to play with. A new storytelling event will be held onboard for kids of all ages which will also include the popular characters from the books. This event is to take place on a sea day once each cruise. There is to be a special parade featuring the loved Dr.Seuss characters called the Seuss-a-palooza character parade. We wonder how popular Fun Ship Freddy will now be! So when will all this start rolling out to the fleet? Well Carnival Splendor is to be the first ship to feature the “Dr.Seuss At Sea” program from February 2014 so if you plan on booking a cruise and you have kids then that might be a good choice, depending on the itinerary of course! The program will be rolled out to the rest of the fleet by 2015. So anyone excited about this industry first Seuss At Sea program? Will we all start forgetting Fun Ship Freddy? Let us know in the comments below.